Sharp Introduces Two New Zaurus Models | BlackBerry Blast! Sharp Corporation announces the introduction into the Japanese market of the SL-C760 and SL-C750 Zaurus Personal Mobile Tools. Twice as fast as the previous Zaurus*1 and amazingly easy to operate, these new PDAs offer a wider range of more effective ways to work with things like office networks and business presentations. 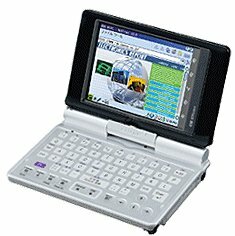 In addition to retaining the popular features of the previous Zaurus, like a 3.7-inch, high-resolution, VGA display System LCD, a full-fledged built-in keyboard, and a horizontal- or vertical-viewing screen, the SL-C760 and SL-C750 have a new processor and 64 MB of memory�double the previous�making for fast, smooth operation. With pre-installed presentation software, users can hook the Zaurus up to a projector for presentations at a client�s office. VPN*2 compatibility means that users can access company intranets and check e-mail on the go with the knowledge that their data is protected by the highest level of security. Movie Player for MPEG-4 video clips viewing allows users to watch TV programs recorded with Sharp�s Galileo Personal Server, making the SL-C760 and SL-C750 perfect for entertainment, as well as business, on the go. The SL-C760 comes standard with a high-capacity lithium-ion battery for approximately eight and a half hours of continuous use. 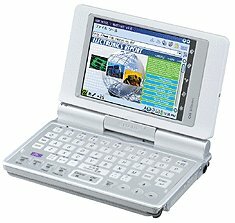 With flash memory boosted to 128 MB, the highest in its class, the SL-C760 holds a five-volume electronic dictionary software.